The Toronto Maple Leafs retooled this summer, trading forward Phil Kessel and signing coach Mike Babcock to an eight-year, $50 million contract. The changes opened the door for other players to emerge. Forward Nazem Kadri, a secondary player for the past few seasons, could be among those who thrive once the rebuild in Toronto reaches its later stages. In 10 seasons as coach of the Detroit Red Wings, Babcock was known for demanding possession-focused play. A quick look at the NHL's enhanced statistics can provide some interesting clues that show which Maple Leafs might thrive in a similar system. In particular, Kadri's ability to drive possession, draw penalties, and generate scoring could make him a perfect match for Babcock's philosophy. After two seasons coaching the Anaheim Ducks, Babcock signed with Detroit prior to the 2005-06 season and continued his focus on puck possession. It stands to reason he will use that same philosophy in Toronto, which has historically gone in other directions. The stark contrast in the teams is easy to see using the SAT Close statistic featured in this space last week. Though the NHL does not record exact puck-possession time, it does record the shot-based statistics that are commonly used as proxies. Essentially, if the Red Wings took 54 percent of attempted shots, then it is accepted that their time of possession would claim a similar percentage of the time in a game. 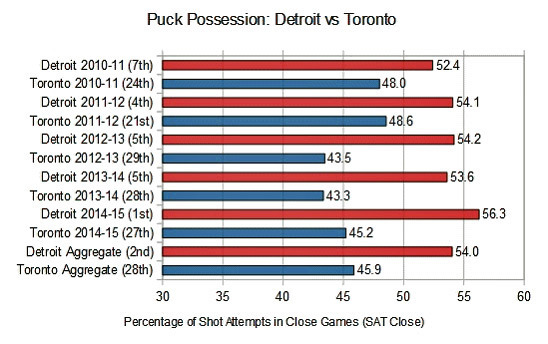 Going back five seasons, this chart demonstrates the huge gap between Detroit and Toronto in this metric. The Red Wings ranked in the top five for each of the past four seasons; the Maple Leafs spent the past three in one of the bottom four positions. Adopting a possession-focused game will be a complete reversal for the Maple Leafs and could take time to establish. Babcock will be looking for Toronto's strongest puck-possession players to lead the way, which is where Kadri comes in. Kadri, who turned 25 on Oct. 6, is potentially Toronto's best possession-based player, and he is entering his prime in a contract season. Though he has spent most of his three full seasons as the Maple Leafs' second-line center, the numbers suggest he could be a breakout candidate under Babcock. The NHL's enhanced stats include the statistic shown above for individual players. We can see what share of all attempted shots Toronto takes with each of its individual players on the ice and use that as an estimate of who is most likely to adapt most quickly to Babcock's style. This chart includes the nine players on the active roster with at least 100 games played for the Maple Leafs during the past five seasons, plus Kessel, who was traded to the Pittsburgh Penguins this offseason, for comparison. It shows that Kadri's numbers are better than Kessel's, several points better than other top players, and second to defenseman Jake Gardiner. Kadri's 47.5 percent may not seem very good by itself, but on a team that averaged 45.9 percent, it's quite strong. There's even a variation of SAT that compares how the team does when each individual is on the ice relative to when he's not. 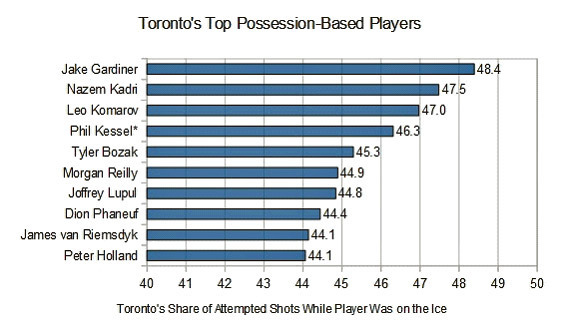 This metric further reinforces Kadri's success specific to other Maple Leafs. In fairness, there are a number of factors that can influence a player's SAT that have nothing to do with his performance, like the relative strength of his linemates and the opposition faced, and how frequently he's deployed in the offensive zone. In Kadri's case, we know that he plays in both zones, that he has played with a variety of linemates, and that he has been matched up against top opponents. His SAT numbers are fully representative of what he accomplishes on the ice. Furthermore, a quick look at Toronto's scoring report shows there's more to Kadri's numbers than these shot-based statistics. During the past five seasons, Kadri has averaged 2.19 points per 60 minutes, ahead of James van Riemsdyk (2.14) and Tyler Bozak (1.84), and fourth behind Kessel (2.73), Lupul (2.45) and Clarke MacArthur (2.38), who now plays for the Ottawa Senators. Additionally, the scoring report includes the number of minor penalties drawn and taken per 60 minutes. With 2.06 minor penalties drawn per 60 minutes, relative to taking 0.75, Kadri not only has one of the best rates on the Maple Leafs but one of the best in the NHL. Babcock's teams have habitually enjoyed more power-play opportunities than its opponent, so this trait of Kadri's will be attractive. After all, the Red Wings drew an extra 100 power plays from 2007-08 through 2009-10, thanks in part to Kadri-like players Darren Helm, who has drawn 1.76 minor penalties per 60 minutes while taking 0.43 during the past five seasons. Neither the Maple Leafs nor Kadri are off to a particularly good start this season. Toronto has been outscored 12-5 in losing its first three games; Kadri has one assist and is minus-5. It will take time for the Maple Leafs to change course, especially without big-name talent. Armed with a long-term contract, Babcock has the flexibility to build his team slowly and properly, and if Kadri continues to draw penalties, generate scoring and drive possession, you can expect him to develop into one of the Maple Leafs' key players.